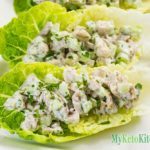 Our Keto Chicken Salad Wraps are an easy lunch that you can make ahead, just keep the lettuce leaves separate and top them with the chicken when you’re ready to eat. It’s that simple! In a mixing bowl marinate the chicken in the salt, pepper, garlic powder and olive oil. Place the chicken on a lined cookie sheet and roast for 20-30 minutes, depending on the size of the thighs. Remove from the oven and set aside to cool for 20 minutes. Cut the cooled chicken into a small dice, around 1/2in/1cm cubes. Place the chicken in a mixing bowl with the diced celery, parsley and mayonnaise. Mix well and adjust seasoning. Spoon ¼ cup of chicken salad into each lettuce leaf, serve and enjoy.